THE HELLCAT IS HERE!! ONLY 10K MILES ON IT!! RECENTLY SERVICED AT DODGE!! 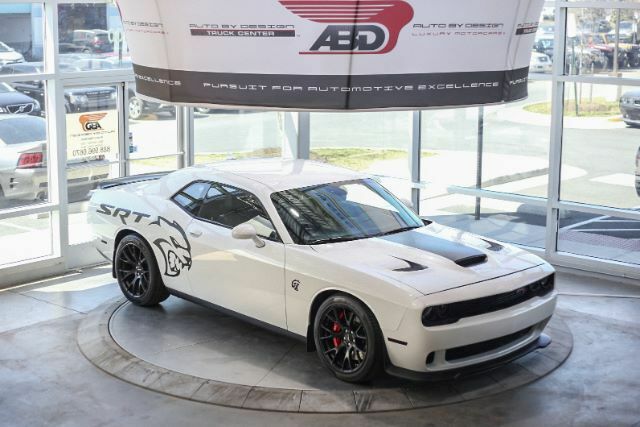 This 2015 Dodge Challenger SRT HELLCAT is featured in Bright White Clearcoat with Black Suede/Leather. This HELLCAT is powered by the legendary 6.2L HEMI V-8 Supercharged Engine mated to a 6 Speed Manual Transmission producing over 700 HP! This is it ladies and gentlemen, the most powerful Challenger released couple of years ago can be yours for a fraction of the original price! Comes well optioned with Premium Leather/Suede, HELLCAT Package, HELLCAT Decals, SRT Steering Wheel, SRT Track Mode, Navigation, Premium Harmon/Kardon Sound System, SAT Ready, AUX, Bluetooth, Front Heated/Ventilated Seats, Heated Steering Wheel, Push Start, Halos, Functional Hood Scoop, Rear Park Assist with Rearview Camera, Performance Dual Exhaust System, Rear Spoiler, 20 inch Black Wheels wrapped in Pirelli Performance Tires! This HELLCAT is ready for its new home! This car is awesome! Regular Key FOB and RED FOB are included. ****** All of our high-end vehicles are processed through a Multi-Point Inspection to ensure that the vehicle is of the Highest Quality & Drivability, please inquire about our vehicles and ask a representative for more information. ****** This 2015 Dodge Challenger SRT HELLCAT comes with a Clean Carfax Report. We offer Nationwide Shipping right to our door step and we offer Worldwide Shipping logistics as well as Financing is also available for our vehicles with rates as low as 3.79%** for well qualified buyers**. Auto loans are our specialty. We are experts in helping individuals with good and bad credit obtain a car loan for the purchase of a new or used vehicle. All of our new and used car loan services are hassle-free and there is no obligation for you to apply for a car loan today. We can help you finance your next car, truck, van, or sport utility today with our easy auto loan application.